The team at Genus are always on the lookout for different plant species and ways to make our client’s gardens stand out. So it is with great interest that we have been reading about this variety of Eucalyptus from Ozbreed – Eucalyptus ‘Vintage Red’. Darker foliage and especially deep red colours are very popular in gardens and to have a tree that provides this colour can be a great feature in your landscape. These plants provide a striking contrast to the mostly green and brown plantings we see in Melbourne. A tree such as Vintage Red seems to tick many boxes as an ornamental feature tree. It has a striking colour and is a smaller growing tree, allowing you to plant a Eucalypt in a smaller garden. However this variety is still quite new and Ozbreed themselves state that its mature features and characteristic are still being observed. So while we are still assessing its practicalities and use, for those adventurous gardeners out there, Eucalyptus ‘Vintage Red’ could be the tree of choice! Description: Vintage Red™ Eucalyptus has beautiful foliage and is a proven landscape tree for southern states, also a great garden feature. Foliage colour is deep red maturing to purple to grey tones. It produces rich dark red stems that are almost black, then peels off to reveal smooth grey bark. Responds very well to pruning, it produces denser foliage and can be kept as a shrub if pruned. 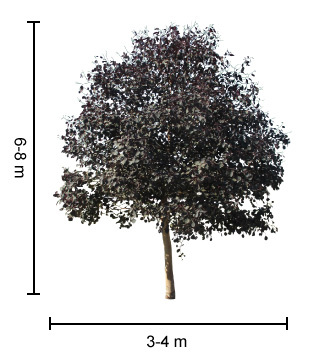 Size: 6 – 8m high x 3 – 4m wide, can be pruned down to 2-4m high. Uses: Attractive specimen tree, cut foliage, landscape tree for southern states. Position: Full sun to part shade. Tolerates cold and drought. Vintage Red™ Eucalyptus suits sandy loam to well drained clay soils. Care: Water as required for 8-13 weeks until established. Plant in a well mulched garden (chunky mulch is recommended, DO NOT MULCH TOO HIGH), mulch should be well below graft union. If required use slow release fertiliser in spring. For best results or to keep Vintage Red™ Eucalyptus smaller prune early spring each year (essential for Sydney). Southern states can leave Vintage Red™ Eucalyptus unpruned to grow taller. Keep an eye out for caterpillars and gum leaf scale. 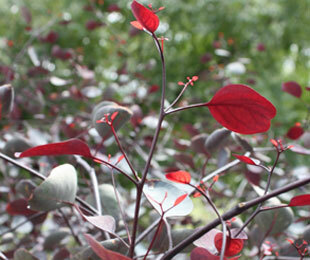 via VINTAGE RED™ Eucalyptus is a landscape tree with red foliage | Advanced Trees Range.